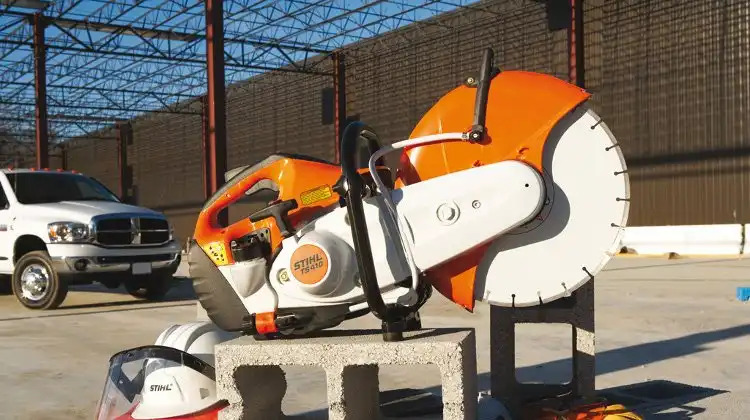 The Stihl TS350 is THE original cut off saw (in my opinion!). Be aware that the specifications vary slightly depending on the age of the machine and is different to that of the later TS350S. In particular the cylinder bore is slightly smaller and a different spark plug is recommended. The picture here is a stock photo of this model of saw, I do own one but it’s in a hundred pieces at the moment in the process of a most uneconomical rebuild. My Stihl TS350 is beyond my maintenance tips for now! I bought the saw for next to nothing on Ebay and was assured that it would run, don’t they all say that? (heavy sarcasm there…) Of course it certainly didn’t run and it was quite clear why with a minimum of examination. Firstly where the carburetor usually is there appeared to be a mound of semi-solidified brick dust, upon cleaning the filth away I discovered that there actually was a Tillotson HL carb under there, albeit a bit stiff and in need of a thorough clean inside and out. My original compression test showed a slight lack of compression but nothing to worry about (or so I thought) and my handy spark plug tester showed that we had a spark. The engine also turned over cleanly enough so I made a few attempts at starting it… nothing… not even a cough! I was wondering how well the carb was functioning and decided to dribble a little bit of fuel into the top of the cylinder to see whether we could get even the smallest bit of ignition… still nothing. At this point I decided to try my compression test again, my theory being that the fuel I dribbled into the cylinder had cleaned the piston and bore a little and may have loosened things up a bit, sure enough the new compression test showed a drastic loss of compression! Now it was time to check out the inside of the cylinder, I stripped the carb and exhaust off and removed the cylinder block. The inside of the cylinder showed some interesting signs of wear… upon checking the piston I discovered that the skirt was severely burned away on one side. Standby for more of this tale and photos!